The 2018 Yankees are now in the record books by hitting the most Home Runs in a season in MLB history! 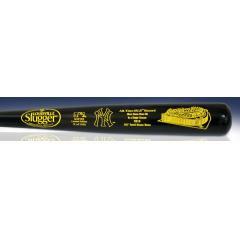 To commemorate the “Bronx Bombers” and their incredible feat, Big Time Bats is proud to release this Louisville Slugger New York Yankees All-Time Home Run Record Bat. This 34" full-size bat comes laser engraved on the front with the Yankees’ logo, the final regular season home run total, and an artist's rendering of Yankee Stadium. The back of the bat is engraved with all of the Yankees' players who have contributed to the home run record this year along with their home run totals. The bat comes with a double coat of lacquer which results in an incredible shiny finish when displayed. With only 5,000 bats being made, we are expecting a sell out so order yours before they are gone! Note, the bat shown is a sample. The final bat will have the final team home run total and all individual player totals.